Thigh Lift Surgery in Honolulu Hawaii | Kevin Dieffenbach, M.D. You may qualify for a minimal incision medial thigh lift which involves an incision only in the groin area. Your surgeon will determine what’s appropriate. 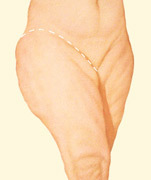 Through these incisions your plastic surgeon will tighten tissues for a smoother, better-toned lower body contour. The smoother tighter contouring that result from a thigh lift are apparent almost immediately, although initially obscured by some swelling and bruising. You may be required to wear a compression garment for several weeks following your procedure to minimize swelling and support the tissues as they heal. When your procedure is completed, dressing or bandages may be applied to your incisions, and you may be wrapped in an elastic bandage or a compression garment to minimize swelling and to support your new contours as you heal. One or more small, thin tubes may be temporarily placed under the skin to drain excess fluid or blood that may collect. You will be given specific instructions that may include: How to care for the surgical site(s) following surgery, medications to apply or take orally to aid healing and reduce the risk of infection, specific concerns to look for at the surgical site or in your general health, and when to follow-up with your plastic surgeon. You may also be interested in the following procedures Breast Lift, Forehead Lift or Liposuction.